Congratulations to second year Master of Science student Devon Carroll! Devon presented a poster at the 2018 International Annual Meeting of the American Society of Agronomy, Crop Science Society of America, and Canadian Society of Agronomy in Baltimore, MD. One hundred posters related to turfgrass science were presented at the conference. 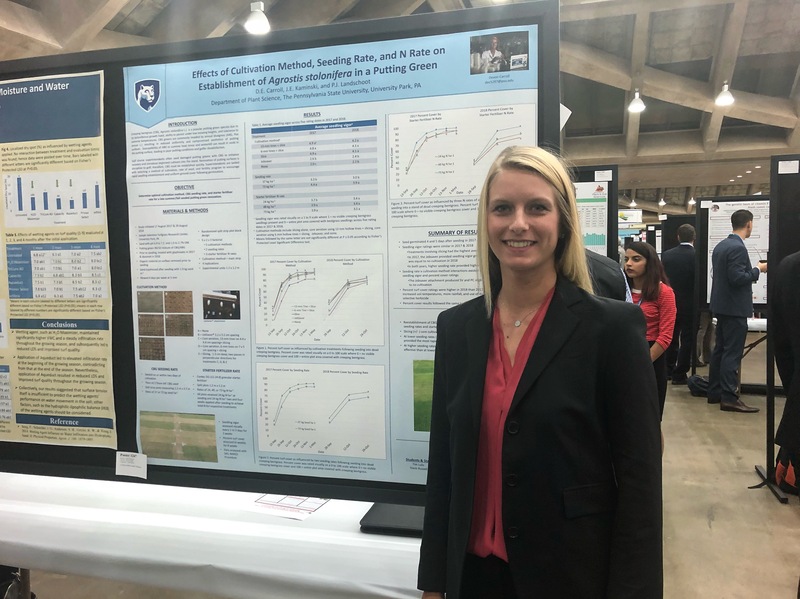 Devon, who is a student in the Turfgrass Management Laboratory, placed second in her division of the graduate student competition for her poster titled “Effects of Cultivation Method, Seeding Rate, an N Rate on Establishment of Agrostis stolonifera in a Putting Green.” Devon’s poster presented data collected from part of her Master’s thesis research that aims to optimize the putting green renovation process.